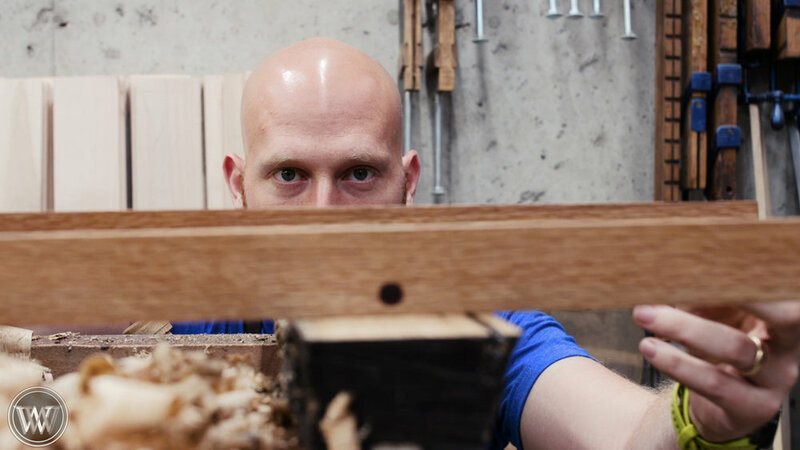 When starting out in woodworking, most people are looking for a cheap source of lumber. Firewood is actually a fantastic source of lumber as it is riven and that will provide a much more stable piece of wood. A lot of the projects that people will work on are small enough to come out of a piece of firewood. You just need to know how to process the firewood to turn it into lumber that can be used. This may be very confusing to people off the bat, but can be made very simple once you understand how to flatten the sides and cut from them. When choosing firewood, you need to look for a piece that is a little larger than you need. This is because you will be taking off a decent amount of material and removing some of the twist from it. So if you want a piece that is 3in by 3in, I would suggest finding a piece that is at least three ½in by three ½ in if not more. Also, unless you want the figure, you are probably looking for a straight grained piece of wood. This will make it easier to work with and more stable for the future. For my board, I chose a piece of white oak. One of the nice things about white oak is that you can get the ray figure showing on one of the sides because it is split radially. The first thing you want to do is flatten one side. I do this with a scrub plane and a pair of winding sticks until I get one side that doesn't have any twist or warping to it. Then, I will roll the piece of firewood 90° and do the exact same thing to the second side but with this side I will make sure that it stays 90 degrees to the first side. With this done, you can now mark out for cutting the boards out of it. These two sides will become your reference sides for all future cuts. I will use a marking gauge to mark off 5 lines running vertically down the piece of wood a ¼ inch apart from one of the reference sides into the board. These will be the lines that I cut vertically on. On mine I'm cutting down about 10 in. This will be enough to provide four sides of the box and two end caps. I chose to use my large roubo frame saw as this makes the cut very fast and a lot of fun. The saw is not that difficult to make, but if you do not have one a handsaw will do just fine it will just take a little bit longer. I cut down 10in on all 5 lines and stop just before hitting the bench. I did not cut all the way through the length of the firewood just to make it easier on myself. Now I can take it over to the bench hook and cut off all five little boards that I just made. I chose at this point to make the box a little bit shorter which meant that I only needed four of the five boards. I ended up cutting them all down to 7 ½ in. This way I have four boards that are 7 ½ by 2in wide and then four more boards that are 2 ½ by 2 in wide. Next up, I will trim all the boards down to their final dimensions, making sure that all the corners are square. The top bottom and front and back are all the same size 7 ½ by 2 in. The two end caps need to be the same size at 2in by 2in. For this box, I chose to make all the joints rabbets. I'm just cutting in about ⅛ in by the thickness of my boards which is about a ¼ inch. To cut the rabbets, I used my Stanley 55, but a rabbeting plane would work just as well if not better as it would be quicker to set up. On the end caps, I'm cutting a rabbet on just the two outside edges where the end caps connect to the front and back panel. On the top and bottom piece I'm cutting a rabbet on all four sides. Take your time and making these cuts and check them occasionally to make sure that they fit together. For glue, I used CA Glue from 2P10. For a small project like this, it is a fantastic and quick glue. I will use the thin glue with activator to lock the boards in place temporarily and then use a thicker gel to soak in to the joints and hold them permanently. I can glue on all four sides to the bottom and make sure that the top is loose and fits well. After the glue has set I'll come in with the hand plane and smooth out all the edges and joints and add a large chamfer to all the corners. I chose to add some Celtic carving to this with a V tool it actually goes on fairly quickly. I spent about an hour doing all the carving of the box and it really makes all the difference in the world to the final project. I find a pattern that I like on Google and print it off. This pattern can be applied to the wood with a glue stick. Then just like tracing a line with a pencil I'm going to trace the lines with a V tool carving chisel. The sounds very intimidating to a lot of people but trust me with five minutes of practice anyone can do this type of carving. just using a small amount to tap it along the lines will give you a nice clean-cut. After all the carving is done the pattern can be peeled off with a card scraper and then we can move on to finishing. For a finish, I chose boiled linseed oil and paste wax. On a small project like this, I really love the way it feels and looks leaving a very original look to the wood without a protective glossy finish. I apply several coats of boiled linseed oil and let it set for about 15 minutes. Then I'll wipe off the excess and let it sit for an hour or two. Then I'll come back in with paste wax and buff that in. Now you're left with a great box that can be used for whatever you want to store in a pretty little shape.